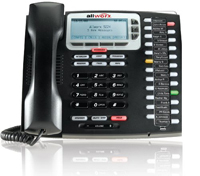 The Allworx 9224 is today’s premier high-fidelity IP phone bringing the latest advancements in IP telephony to today’s business leaders. Supporting between 24 to 96 programmable function keys (PFKs) with the additional Tx 92/24 Expander units, the Allworx 9224 can deliver a multitude of call appearances, line appearances, speed dials, busy lamp fields and an array of other functions. This well-designed and stylish phone is the ideal solution for everyone from executives who make and receive a high volume of calls to receptionists who must monitor a huge number of lines all day long. The intuitive design of the Allworx 9224 allows users to upgrade fromtheir old key system with ease – no retraining is necessary.